Professional looking animation results in just few minutes! Use our done for you, ready-made templates to create a high quality animations fast. Our “templates are designed, scripted and ready for you to use within minutes. Engage, explain and sell with impact using just a short, simple animations. They’re proven to be more effective than any other form of video or text communications to grab attention in the workplace. -When you can’t afford to be ignored, use ADnimate PRO to grab the attention of your bosses and colleagues, in any business situation. -Fight distractions in class and grab your students attention by making your education materials come to life with ADnimate PRO! It’s great for school projects too! -Interact, teach and engage friends and loved ones using ADnimate PRO for special events and occasions and for when you can’t afford to be ignored! 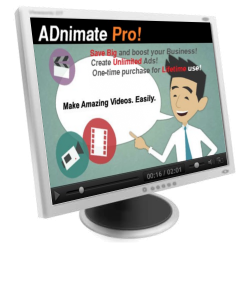 -You can start your own advertisement or video animation business and make profits from online marketers and business owners in social media.